In the early 1900s, airplanes were a novelty and a spectacle, but some people were already thinking of what other uses could be made of them. This is why there were thousands of people in Los Angeles running out into the streets to be "bombed." Roy Knabenshue had both a name and life that sound like they were made up for a comic book. He was known as the "King of the Air," and earned that title by being first through the door throughout much of the history of aviation. Born in 1876, he started out by giving people hot air balloon flights at county fairs – taking the name "Professor Don Carlos" because he wanted to keep his real identity as a wealthy young man from a prominent family secret. When he went to the first World's Fair in St. Louis, he met a man, Thomas Baldwin, who had constructed a dirigible. Baldwin wanted to pilot it, but was too heavy. So Knabenshue became the first person in the US to pilot a dirigible. 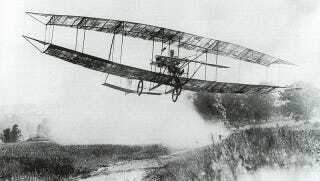 He later also performed the first successful night flight of a dirigible. When planes came around, he jumped right on board. Later in life he would scout out air routes for the Parks Service and build planes and blimps in his spare time, but early on, he performed in the kind of terrifying stunt shows that got people killed – climbing up on the wings of flying aircraft and such. He was a celebrity daredevil, so naturally people turned out to see his nighttime airplane flight into Los Angeles in 1908. Once he got over City Hall and the business district, Knabenshue threw giant parcels of confetti overboard which burst and showered the residents with bright colored paper. His flight was not a lighthearted joyride meant to garner publicity or drum up civic pride. He was simulating a bombing. The government wanted to know whether these new airplanes could be used to destroy a city without any particular resistance from the city itself. Knabenshue proved they could. As a result of his run at Los Angeles, people started predicting that bombs from planes could be a force to be reckoned with in an upcoming "great war." It wasn't too long until they were proven right.